Tea tree oil is currently included in the U.S. Food and Drug Administration's (FDA's) Everything Added to Food in the United States (EAFUS) database. Tea Tree Essential Oil is indigenous to the swampy regions of the eastern Australian coast. Its botanical term “alternifolia” means "having leaves that alternate on each side of a stem.” Tea Tree essential oil has a powerful stimulating and cleansing effect on the endocrine and integumentary system. Perfect for teenagers trying to avoid the embarrassing facial blemishes that commonly come with the age. Because if has such a strong stimulating effect on the body, it is also a perfect companion with eucalyptus or rosemary during cold and flu season to help stimulate the body and protect it. Tea tree essential oil can be used with our sanctuary all-purpose cleaner to give it stronger cleaning and cleansing power. Caution: According to secondary sources, information from animal research suggests that tea tree oil should be used cautiously during childbirth, because it has been reported to decrease the force of spontaneous contractions, which could theoretically put the baby and mother at risk. of animal origin or products containing such ingredients. -Egg, Unpasteurized egg and egg products. Does not contain any nitro musk. We certify the product has not been tested on animals. Antiacne agents: In human research, tea tree oil decreased acne lesions, comedones, pustules, and papules (1;2;3). Antibacterials: Multiple studies have reported the antimicrobial effects of tea tree oil (24;10;11;25;12;27;28;29;30;32;33;34;35;109). In human and in vitro research, topical tea tree oil had activity against methicillin-resistant Staphylococcus aureus (MRSA) (58;53;54;111;112;96) and vaginal infections (57;89). In one in vitro study (113), tea tree oil stimulated differentiation of white blood cells. Antifungals: The antifungal effects of tea tree oil have been reported in multiple studies (13;132;19;114;115;22;116;35;118). 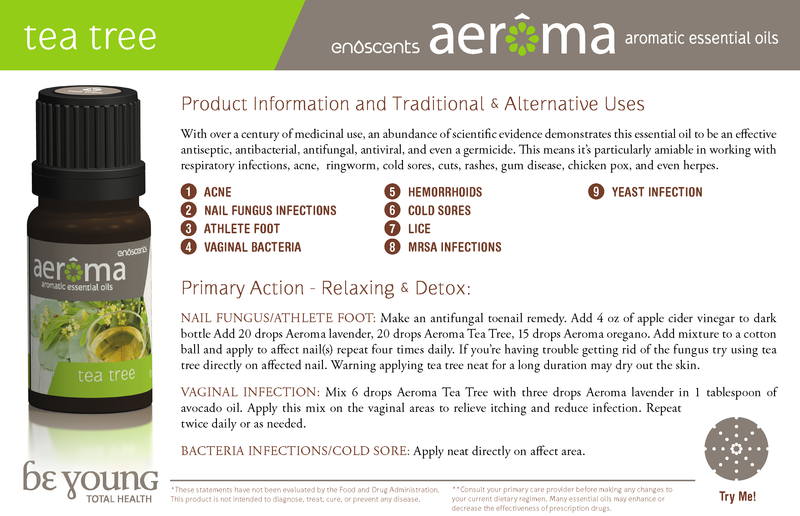 In human research, topical tea tree oil had activity against onychomycosis (119;51;55), oral thrush (87;63;86;120), and tinea pedis (119;88;56). Antihelminthics: Theoretically, tea tree oil may increase the effects of antihelminthics. Antihistamines: In human research, tea tree oil reduced histamine-induced skin inflammation (78), but in other human research, the size of a histamine-induced weal increased after tea tree oil application (80). In human research, topical tea tree oil decreased allergic reaction to nickel (80;79). However, in other human research, tea tree oil resulted in allergic contact dermatitis (97;98;99;66;100;101;102;68;103;67;69;104;62;105;106;5;65;107). Anti-inflammatory: In laboratory studies, tea tree oil showed anti-inflammatory properties (9;12;121;83). However, in one in vitro study (113), tea tree oil stimulated differentiation of white blood cells. In human research, tea tree oil decreased inflammation induced by histamine (1). Antineoplastics: In in vitro research, tea tree oil has shown anticancer effects (46). Antiparasitics: In human research, tea tree oil cleared ocular Demodex infections (59;82;83;91). Tea tree oil (alone and in combination with lavender) cleared lice infestations (122;123;124;118;125;126). Antivirals: In in vitro research, tea tree oil had antiviral activity (127). In human research, the antiviral activity of tea tree oil was effective against Molluscum contagiosum (a viral skin infection) (60) and warts from the human papilloma virus (92), while its effects against genital herpes simplex virus were inconclusive (85). Agents that cause adverse dental effects: In human research, tea tree oil decreased gum inflammation and bleeding and had inconclusive effects on dental plaque (77;31;129). In vitro, tea tree oil killed periodontopathic bacteria (34). In human research, a mouthwash of tea tree, peppermint, and lemon oils decreased bad breath (130). Patients from an intensive care unit (ICU) used a solution of essential oil (tea tree, peppermint, and lemon oils). Dermatologic agents: In human research, topical tea tree oil caused a rash (62), resulted in allergic contact dermatitis (97;98;99;66;100;101;102;68;103;67;69;104;62;105;106;5;65;107;1), and increased or worsened the weal induced by histamine (80). In other human research, tea tree oil decreased acne lesions, comedones, pustules, papules, dandruff, and allergic reaction to nickel (80;79;1;2;3;81). In vitro, tea tree oil dose-dependently decreased skin integrity (131), and, according to secondary sources, topical tea tree oil preparations may result in drying of the skin. hematology and blood disorders: In human research, ingestion of tea tree oil resulted in neutropenia (6). According to the National Library of Medicine's Drugs and Lactation database (LactMed), tea tree oil may have mild hormonal (antiandrogenic and estrogenic) activity. Hormonal agents: Prepubertal gynecomastia has been linked to tea tree oil and lavender oil use (73;1). Immunosuppressants: In human research, ingestion of tea tree oil resulted in neutropenia (6). Insect repellants: Tea tree oil (alone and in combination with lavender) cleared lice infestations (122;123;124;118;125;126). Neurologic agents: In human observational research, tea tree oil taken orally resulted in symptoms of CNS depression (4;7;94;90;8). In animal research, topical tea tree oil caused ataxia, weakness, muscle tremors, CNS depression, and malcoordination (94).